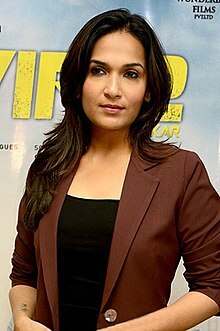 Soundarya Rajinikanth (born 20 September 1984) is an Indian graphic designer, producer and director who primarily works in the Tamil film industry. She is the founder and owner of Ocher Picture Productions. Soundarya began her career in films as a graphic designer. For those starring her father Rajinikanth, she designed the title sequences. She became a film producer with Goa (2010). She made her debut as a director with the film Kochadaiyaan (2014). Soundarya did her childhood education in the Ashram Matriculation Higher Secondary School in Velachery, Chennai. In 2007, Ocher Studios signed an agreement with Warner Bros Entertainment to partner up in producing and distributing Tamil films. Her directorial debut was supposed to be Sultan: The Warrior, a 3D animated film featuring her father Rajinikanth. Despite heavy pre-production promotion, including a teaser of the film and an interactive website, the film was dropped. She instead directed Kochadaiiyaan, India's first motion capture film, with Rajinikanth in the lead role. Through Kochadaiiyaan, Soundarya earned the distinction of becoming the first woman to direct her father in a feature film. At the NDTV Indian of the Year awards 2014, she was honoured for "Technical Innovation In Film". Her next directorial venture was Velaiilla Pattadhari 2, shot in Tamil and Telugu languages. Soundarya is the younger daughter of actor Rajinikanth and his wife Latha. She has one elder sister, Aishwarya R. Dhanush. Soundarya married Ashwin Ramkumar, an industrialist, on 3 September 2010 at Rani Meyyammai Hall in Chennai. The couple has a son, Ved, born on 6 May 2015. In September 2016, Soundarya revealed that she and her husband had filed for divorce by mutual consent due to irreconcilable differences. In July 2017, the couple officially divorced. She has married Vishagan Vanangamudi, an actor and businessman, on 11 February 2019 at Leela Palace in Chennai. ^ Gupta, Priya (12 September 2013). "Rajinikanth is extremely persistent". The Times of India. Retrieved 28 September 2016. ^ "My mom is the boss: Soundarya Rajnikanth Ashwin". The Times of India. 12 September 2013. Retrieved 4 March 2014. ^ "Soundarya ties up with Warner Brothers!". Smubla. 8 January 2008. Retrieved 23 November 2011. ^ "Soundarya and Aishwarya – the sisters sort it out". The Times of India. 2 April 2012. Archived from the original on 7 July 2012. Retrieved 13 May 2012. ^ Ronamai, Raymond. "'Kochadaiiyaan' Box Office Collection: Rajinikanth-Deepika Starrer Rocks on Opening Day". International Business Times. Retrieved 28 September 2016. ^ "Soundarya Rajnikanth is the first daughter to direct her father". The Times of India. 16 September 2013. Retrieved 18 October 2016. ^ "NDTV Indian Of The Year: Soundarya Rajinikanth honoured for Technical Innovation In Film - NDTV Movies". NDTV. Retrieved 28 September 2016. ^ "'Kabali' producer to bankroll Soundarya Rajinikanth's next directorial project". The New Indian Express. Indo-Asian News Service. 27 September 2016. Retrieved 18 October 2016. ^ "Soundarya Rajinikanth to direct Dhanush in VIP 2". The Hindu. 9 November 2016. Retrieved 15 November 2016. ^ "Soundarya Rajinikanth wedding : Rajinikanth daughter Soundarya marriage pictures". Allvoices.com. 4 September 2010. Retrieved 23 November 2011. ^ "Its a boy for Soundarya Rajinikanth". India Today. Retrieved 28 September 2016. ^ "Soundarya Rajinikanth confirms divorce". The Times of India. 17 September 2016. Retrieved 17 September 2016. ^ Goyal, Divya (5 July 2017). "Soundarya Rajinikanth And Ashwin Are Officially Divorced". NDTV. ^ "Soundarya Rajinikanth set for second marriage in January". The Times of India. 13 November 2018. Retrieved 16 November 2018. ^ "Soundarya Rajinikanth gears up for second wedding in January 2019". India Today. 13 November 2018. Retrieved 16 November 2018. ^ "Soundarya Rajinikanth to wed again". Anupama Subramanian. Deccan Chronicle. 14 November 2018. Retrieved 16 November 2018. ^ "സൗന്ദര്യ രജനീകാന്ത് വിവാഹിതയായി; ചിത്രങ്ങളും വിഡിയോയും". ManoramaOnline (in Malayalam). Retrieved 12 February 2019. Wikimedia Commons has media related to Soundarya Rajinikanth. This page was last edited on 14 April 2019, at 16:53 (UTC).